Iridescent moonstones, surrounded by little diamonds, sparkle and hang nicely under classic oxidized sterling silver ear wires. 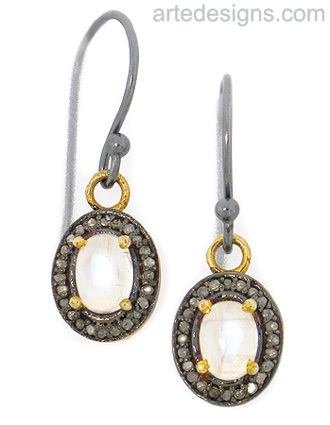 Moonstones produce shimmering colors when viewed from different angles (difficult to capture in a photo). Moonstone is believed to bring good fortune, to enhance passion, and balance the yin and yang. Just under 1.25 inches long. Sterling silver wires.